Here's a random piece of functional home furnishings that Allie and I have owned for the vast majority of our relationship. 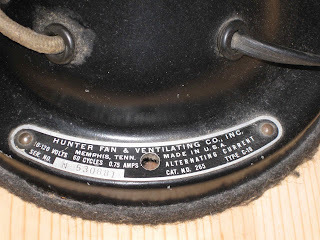 Why, of course, it's a fine Hunter Zephair oscillating fan. We picked this up in the early-90s at Chicago Recycle Shop (on N Clark in the Andersonville neigborhood). Allie and her friend Barb discovered the shop shortly after getting their drivers licenses - they'd sort through the piles of used clothing in the basement in search of swingin' 1960s dresses, boots and the like. George, the proprietor of the shop, would always ask the two of them just why they wanted to dress in those old clothes. I also enjoyed the basement, but mainly to search through the tools and cool electric fans - like this example. 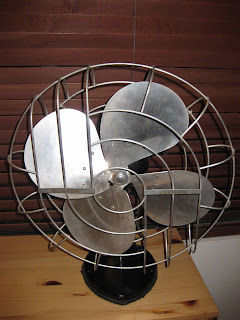 Why do I like old electric fans? Two words - Green Lake. 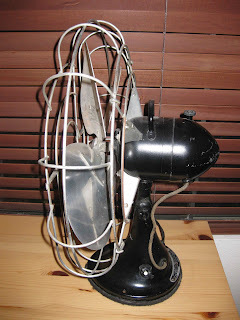 My grandparent's cottage had a pair of small old fans - a fixed "ZERO" and an oscillating "ESKIMO". Highlights include the study metal construction, good air output, a gentle hum as well a violent end to your fingertips and/or knuckles if you accidentally put your hand through the very large openings between the grates. My brother and I brought these back home with us to Illinois when my grandparents sold the place on Green Lake, but they only lasted a couple of seasons before they ended up in some Cook County landfill. From what I can tell, this gem dates from the 1940s. When I picked it up it was in serious need of a cleaning and repaint. Trouble is, shop owner George always wanted good money for these old fans - upwards of $100. However today was my lucky day as George was taking the day off. I brought it up to the counter and asked how much, his niece gave it to me for a song - $20. I polished the aluminum blades, treated it to a coat of gloss black Krylon, recovered the base with black felt and lubed the bearings. It's come in handy over the years, quietly and reliably chugging away while Allie and I spent nine A/C-free summers in the sixteen summers we've lived together. I bought the same fan from an antique dealer for $20. It needed a new cord. My husband fixed it today and shined it up and I love it! !